Before starting this section of the manual, we assume that you’ve read the Introduction, that you’re familiar with the Basic Concepts and that you’ve created a Flow Machine. Units use connections to indicate in what order they should be called and to pass values from one another. We’ll cover connections in the next article. For now, let’s focus on units and their ports. The first thing you’ll notice is that your new units appear as dimmed out. This is because Bolt warns you that their value is never used. 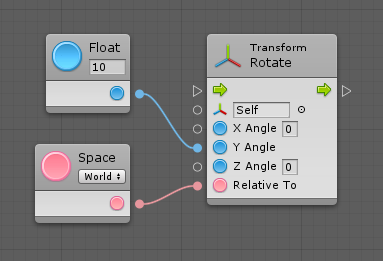 Indeed, we’re not using the result of the addition anywhere, so these nodes are currently “useless”. It might take some trial and error to find the right overload at first, but you’ll quickly get used to the available options. You can use the built-in documentation or the Unity manual to help you distinguish between each variation. Take a moment to explore the unit options and browse around the fuzzy finder. But don’t worry if you’re overwhelmed at first: we’ll have a look at every kind of unit over the next few articles. Let’s look at the anatomy of a unit. 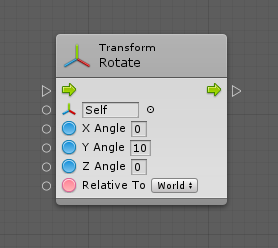 In this example, we created a Rotate Transform unit, which you can find under Codebase > Unity Engine > Transform > Rotate (X, Y, Z, Relative To). The top part of a unit is its header. It’s a quick summary of what the unit does. In this case, it tells us that it is invoking the Rotate method on a Transform component. On the left side, you’ll find the Input Ports. On the right side, you’ll find Output Ports. Value Ports are used to connect… well, values. Each value port has a Type that must be matched when connecting nodes. Below, in the blue rectangle, you have the unit’s settings. They vary from unit to unit, and some units don’t even need settings. In this case, we could change the method that we are invoking if we wanted. In the green rectangle, you have the documentation for each port. First its name (e.g. “X Angle”), then its type (e.g. “Float”), and finally its summary (“Degrees to rotate around the X axis”). Finally, in the yellow rectangle at the bottom, Bolt will display all the warnings for the unit. For example, here, Bolt warns us that the unit is never entered, because we never connected the “Invoke” control input port. If we had dimming enabled, this unit would therefore be dimmed out. You’ll have noticed by now that some value input ports have small fields next to them. These are called Inline Values. If the port is not connected, the value of this field will be used instead. Most common types support inline values, but not all types do. 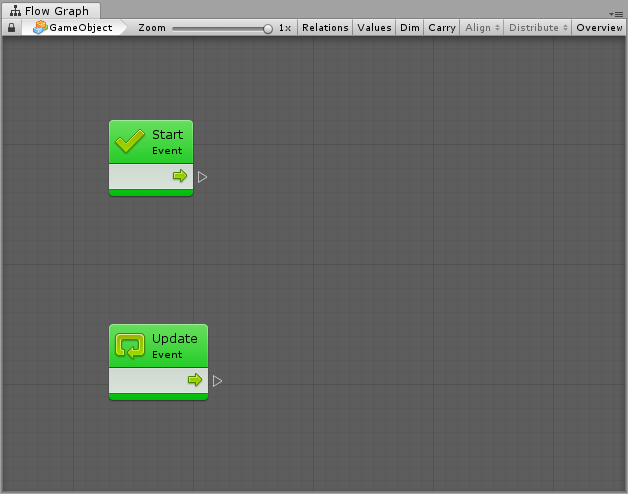 Inline values are useful to keep your graphs tidy by avoiding the creation of literal nodes for every value input port. Now that we’re familiar with units, let’s have a look at how to create these connections!